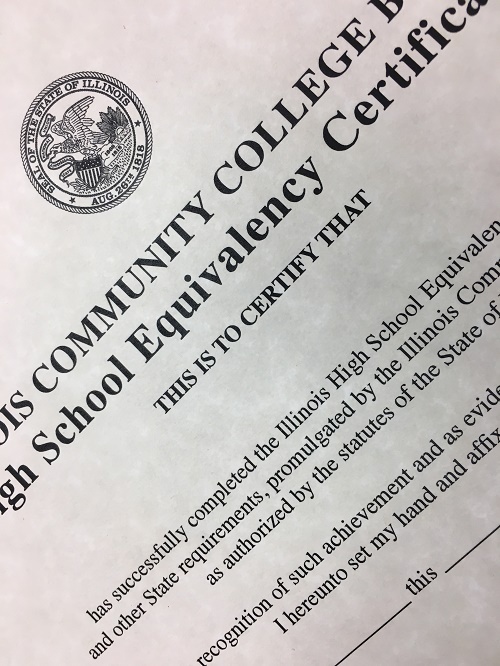 Illinois State law requires an Illinois State Constitution test be passed to get the High School equivalency certificate. The testing location is Kankakee Community College (815-802-8300). Records for Iroquois and Kankakee Counties are kept in the Regional Office of Education. A High School Equivalency transcript or certificate may be requested and picked up in person at 1 Stuart Drive, Kankakee, IL (map). Transcript & certificate fees must be paid with cash or money order. The regional office does not accept personal checks or credit/debit cards. What's the difference between a transcript and certificate? A transcript shows the scores for each segment of the test. Colleges and many employers require it to be “official” which means the document is sealed envelope with an official seal on the envelope. A certificate is the diploma handed out on completion of a High School program. To receive your documents, you must download, fill out and mail in this form with payment. There is no way to process electronic or verbal requests.